Lisa Campion is a Psychic Counselor, Energy Healer and Spiritual Teacher who specializes in training emerging psychics, healers and empaths to fully step into their gifts and live their life purpose - because, as she says, the world needs all the healers it can get! She’s been a professional psychic for decades and she also teaches Reiki. In this interview, she’s talking about her book The Art of Psychic Reiki : Developing Your Intuitive & Empathic Abilities for Energy Healing, which integrates psychic development with learning Reiki. Well, it comes from a class that I've been teaching. I've been teaching reiki for about 20 years. And just in case you don't know what reiki is, reiki is a very gentle, hands-on energy healing technique from Japan. It's pretty exciting these days because, out here on the east coast where I live, all of the big hospitals have reiki in their complementary and alternative medicine units. So you can go to a big Boston hospital and ask for a reiki person to come and do this energy healing on you while you're in the hospital while you're getting chemo, pre and post surgery. It's really used for pain management a lot these days. Works great for anxiety and depression. It's getting to be more and more popular, more and more mainstream. So I train a lot of people to do reiki. I've been teaching for 20 years. What I noticed about it and why psychic reiki is that studying particularly reiki, energy medicine in general, but particularly reiki, often opens people who are sensitive. That makes me sad because I feel like the world needs all the healers it can get. That's how I decided to teach both of them together and why I wrote a book about it. I'm just wondering, that question comes up for a lot of people that I interact with, this idea of being opened up and being afraid of that happening. And kind of like, resisting it and sort of backing up from that. What do you say to somebody who's experiencing that, or on the verge of sort of feeling like they're opening up a little bit. What do you recommend that they do to sort of protect themselves but also move forward? Yeah, it can be super overwhelming to people, so people who are sensitive and empathic, they feel, they're worried, they're afraid they're going to get flooded or overwhelmed or swamped by other people's feelings and emotions. That's hard for them. The people that are psychically-inclined may have a lot of fear about what that means. Are they gonna see bad things? Are they gonna go crazy? Are people gonna think they're crazy? What are they gonna tell their friends and family they're seeing people, they're having these psychic experiences, and there's still a lot of stigma about this. I know I'm preaching to the choir with you on this topic, Slade, but, you know, not too long ago, they would put people like us in the mental hospital for talking to angels. Talking to angels and talking to their Uncle Fred would land you in the looney bin. So people have to sort of unwind the fear around that. And then, I think the best thing to do about it, I think everyone has to make a decision about whether they're going to accept or allow that part of themselves. Can we own it and what, if you do, then we have to sort of train. So, the empaths need to train, learn how to manage their energy, which nobody ever knows. Because very few people get taught that. And psychic people need to learn basic... I think it's like being street-smart. Like, how do we, when we have enough information, it's less scary than if we just don't throw open the door and don't have any context for it. You know, you're right to talk about the preaching to the choir thing. Even I forget how many people who are going through this, it's new for them. It's sometimes hard to remember when you've been doing this for 20 years that there's somebody who's experiencing this for two weeks or whatever. I keep being reminded, especially on social media and the Facebook groups, so many people posting about being in that part of the process. So I do want to be really sensitive to the fact that not everybody feels as bold and brave as we might. So who is this book for, ideally? It's for people that are new to the idea of reiki and wanting to learn. So it gives my version of reiki, which is pretty practical, pretty grounded, pretty technical in a way. And I think it would also quite benefit people who are already reiki practitioners. You know, there's over a million reiki practitioners just in the United States alone and many more worldwide. Those people who have studied reiki, who want to learn more about it but also want to really incorporate the psychic, intuitive energy management piece because hardly anyone teaches that. There are a lot of fabulous reiki teachers, but they don't teach energy management basics. They don't teach how to really open our intuition, how to really strongly connect with our guides, our reiki guides. There doesn't seem to be very much where that's all in the same package. There are photographs in your book. There are infographics. You've got hand positions for working on yourself, for working on other people. Can we learn to actually practice reiki from this book? You could. Yeah. It was designed to be a manual, so you can use it like a manual with a lot of the psychic and energy management techniques. And even those techniques are very technical-oriented, so teaching you specifically how to ground, how to clear yourself after a session, how to connect with your guides, what to do when x, y and z happens. Of course, when we're doing reiki, you do need to receive an attunment. The attunement can only be done by a reiki master. And the answer really is no unless you had a reiki attunement. So you could get everything you needed for reiki level one and two from the book except the attunement. You still need to find somebody near you who would do that for you. Well if there's that many people out there who are reiki practitioners, I guess that's a pretty realistic thing to be able to track down. What do you suggest someone does who maybe doesn't live in a major city, if they want to do the attunement? How would they find someone? Lots of people do long distance attunements, and I do too. So I'm happy to do long distance attunements for people that I teach. Actually for the first time ever this summer, I taught a virtual reiki class via livestream. So I had a bunch of people in the room with me, and then I had a whole bunch of people on livestream. That was very cool. I loved it. For those people that were taking the class virtually, I would attune them long distance. So you can get long distance attunements. You can get long distance reiki treatment sessions and long distance works just as well. Some people say even better than when you're in the room. They've done a lot of studies, and I read this really interesting study recently about this. Long distance healing sessions seem to be more effective because... I don't know if there's less interference, there's less personalization. We don't take things personally as much. There's not, maybe as much mingling of our personal stuff into a session when it's long distance. Like sensory distractions or something? Yeah, or like our personal agenda. Like you really like that person and you really want to help them. Sort of where we get hooked as a person, not as a healer, with our clients. And doing long distance work takes that out. I know you got all the channels loaded up, but that's how you make your connection. It's kind of like when you listen to a piece of music and you really want to go in deep, you close your eyes and really focus in on it. But I am a people watcher, so I'm reading the subtle clues of like, the jewellry choices that someone made or what they're wearing or why does she have that hairstyle? It's very distracting. And I think the long distance takes that away. We get sort of a more neutral, more objective connection with long distance. You know what? I just have to say, I think technology's so amazing. And because I really think that technology is a friend to our... You know, we talk about the inner connectivity of human beings and collective consciousness and the zeitgeist and our ascendance as a species. I really believe that our technology, in particular our communications technology, amplifies our ability to do that. It really does have this opportunity to be hyper-connected. And to hear that there is a study that shows, not only does it works, but it actually might even work better - that's exciting. And it was so exciting for me to do the livestream this summer. That was an incredible experience for me as a teacher, because I had a room full of 20 people, but I also had 10... One from... They were all over the world! And that livestream technology put them in the room with me. So cool. Are you gonna keep doing those, do you think? Periodically? I've always wanted to ask a reiki practitioner this, and for some reason I haven't. Maybe because I don't want to show actually how little I know about it. But I'm just curious. What kind of things can we expect to experience if we are receiving reiki from someone? Should we feel something? What happens? Yeah it's a great question. Reiki is a very nurturing and filling kind of energy. We say it comes in at the frequency of unconditional love. Which, I think if you're going to be stuck on planet earth, stuck on a desert island with only one frequency, that's a really good one to have, you know? Most people are really, sort of like turning on a faucet and standing under a waterfall where what you're receiving is this unconditional love. People tell me that it's very relaxing. It's very warm. So the reiki practitioner's hands get warm. That's sort of a signature of reiki - it's a hot hand healing technique. And people will feel sort of this, sometimes if you're sensitive to the flow of energy, you might feel pulsing, tingling, heat, kind of the feelings of energy moving. Other people don't feel that but they feel the results of the energy moving. So they'll feel relaxed, warm, peaceful, nurtured, energized. It's good. It's a good feeling. I'm only becoming just aware, not only through you, but through another reiki practitioner that I work with, and I do mentoring with a lot of people around the intuitive stuff and the building of their practice who do have reiki and incorporate that into their practice. I come from the other side of where you're coming from, which is, I came in through the intuitive. And so much of what I do is just, almost a talk therapy or talk coaching format, and I have seen that there is this real beauty in having a healing component to your practice. For me, that's the coolest thing. I do, about half of my sessions are in person in my office, and half are long-distance, phone or skype. The in-person sessions, because I'm a visual psychic and I'm looking at everyone's energy field, it's really painful for me to sit in a chair and see what's going on inside your energy field and not want to do something about it. So you can see me look at my client, I'll be like, 'Let's get you up on the table.' Because I want to get my hands on you. I want to sort of smooth things out or get rid of some blocks or kind of patch you back up a little bit. It's so satisfying to me to be able to do that. Well that's interesting you talk about the fact that you are more of a visual psychic. I noticed, just for me personally, looking through the book, one of the sections that I was most attracted to was the level of detail that you go into about reading the aura of the client. Talk to me a little bit about that. Is this stuff that you've observed through your practice? Did you learn it from someone else? There's a really cool level of detail specifically about reading the aura that I was surprised to find in here. I thought it was cool. I think I can teach people to do it pretty quickly. It's finding your open channel, so look, I teach my students to have somebody stand in front of a white wall and begin to observe. Like, what do we see? What do we see with our eyes open? What do we see if we look out of our peripheral vision or if you squint your eye? What do you then see if you close your eyes, because you're going to see better. Your psychic eye will kind of kick in. I like to also change the word 'see' to 'perceive'. So what do we perceive? Because everyone has different channels. Somebody might feel it, hear it. You might ask, 'Well what does that person's aura look like?' And you get the answer as a word in your head or a feeling in your body. A smell, a taste, a colour. There's all kinds of ways that that comes in and I think a lot of it is, that information is very available to us. Because we're constantly unconsciously reading other people's energy 24/7. We're all masters at it. We're ready. We're just doing it mostly unconsciously. So bringing that sort of consciousness, and then being aware of what channels we're receiving that information on is where we get really, oh, no, I get it. I notice that there's also an emphasis on empaths, which is really cool because, as we were talking about earlier, this experience of being sensitive and opening up to things. Tell me why particularly you chose to emphasize so much training around that energy hygiene, or that energy protection component. Thanks for that question. It's a great question. What I notice about empaths, and I really work a lot with empathic people, is that I believe, the qualities of being an empath (so being able to feel what people are feeling with your own emotions, being able to put your hands on people, touch them and feel what's going on in their body in YOUR body), I believe that those two things are like the perfect diagnostic x-ray, MRI, for healers. And reiki is such a great entry point for people that are wanting to study. In fact, I will often tell my empaths to learn reiki, because learning reiki gives them an outlet for their desire to heal people. It teaches you how to not use your own energy, but to use universal life force. We can't run out of this universal supply of energy so you're not giving up your personal energy in reiki. And then it teaches you how to really ground, how to clear yourself, especially the way that I teach it. We learn these energetic basics of, how do we manage our energy field? So I think it's very good on every level, for people that are empaths. You know what I love about that too is so many people who talk about being highly sensitive, or experiencing empathic phenomenon, feel victimized by it. They feel afraid or anxious or beleaguered in some way. There's a lot of negativity and sort of victim-mindset around that sometimes. I really love, especially some of the people, like yourself that I've had on the show, who speak about the idea of being an empath from this really empowered perspective. That sensitivity is a gift and it's an ability that you can develop to do something really active in the world to help other people, right? And I feel like what needs to happen is the empaths need to learn how to manage their energy, to manage their sensitivity. And that's the part that's missing for them. So it does absolutely feel like a curse. Like, take it away from me, make it go away, until we learn, first of all, what it's for. And then, second of all, how do we actually, in the moment, manage our energy. How do we ground? How do we clear energy we picked up that we don't want anymore? How do we pick up a habit of having a stronger energy field, or less porous energy field? And it's not hard to learn. There are many, many easy ways to do it. Once you begin to do that in a habitual way, so you change your habits, your energy management habits, then all of a sudden, the world is easier to be in. People don't drain you. The supermarket doesn't freak you out. And you can really then step into your gifts. And I feel this, it makes me really sad, because I feel like there's this terrible catch-22. Empaths want to help. They want to serve. They know that's what they're for and they can't figure out how to do it without this missing piece. Something that I had an epiphany around there was you talking about was learning to use universal life force energy instead of using your own energy. And I thought, you know what? Maybe when I experience the anxiety of being drained, or from interacting with too many people, maybe it's because I'm shifting into a mode where I'm using my own energy and I'm not consciously aware of that. I'm gonna go sit with that concept. That was actually really revelatory for me. I'm having a moment over here, thinking, Ohmygod, is that what I'm doing? Like I'm gonna go work on that piece. We ALL do! It's what we all do until we learn otherwise. Until we learn there's another way. We give up our energy, and when we don't have anymore, we steal energy from other people. We steal energy from coffee, sugar. We kind of have to... We become desperately drained and we then have to figure out how to fill ourselves up through addictions or through sort of energy vampirism. All of these horrible things that we don't want to do. So people are always talking about energy vampires. I'm considering this as the topic of my next book, by the way. What is the truth about energy vampires? Some energy vampires are people that are so empathic and they've been so badly drained that they're now desperate to get energy from anything. We go into system breakdown when that happens. That's kind of a more compassionate way to think about them too, to tell you the truth. Because when I hear 'energy vampire', I'm thinking, somebody with a personality disorder, who's like, 'Oh god, (eye roll) here they come.' You know what I mean? So to think about that from a more compassionate place of like, why are they doing that? What happened to them that they got to that point? That's a good thing to keep in mind. What are your feelings about that? What's going on? I think that it's real. I definitely have, in all the years that I've been doing work, you know, doing sessions for people, I think most of the time, probably a good 80% of the time, whoever's doing it is totally unconscious that they're doing it. You know? You're going through a rough break up and your ex is walking around, muttering, cursing you the way we think, that kind of thing, and if we're sensitive and we're so psychically connected to somebody, we're gonna feel it. You know? We're gonna feel that. And I think that's most of the time. It does happen. There are definitely cultures or people who are very curse-prone. And I lived in a town with... For awhile, my office was in a town with a population of people who really loved to curse. And you'd go, you could go pay this lady $500 to put a curse on your friend who stole your boyfriend. Then if you're the person that got cursed, you go to the same lady to pay her $500 to get that thing off. And then people having maybe not very good boundaries. So if you're very leaky and you don't have a strong boundary, and the outer edge of your energy field is breached through trauma or whatever. There's many reasons why that happens. Then you can be really sensitive to that. My feeling is that you kind of have to participate in it at some level. Like, you've gotta be in some kind of relationship with this person in order for that phenomenon to occur. That may or may not necessarily be in your book. I just wanted to ask you about it while you were talking about it. And you were thinking about perhaps writing something about the topic. It is something that people bring to me in my practice, and I'm always a little bit suspicious of it being what they perceive it as. You know, that there could be something else going on. One thing I want to ask you about the book though is, we talked a lot about the reiki and the energy management part of it. Can we also learn to do psychic readings through this book? So I talk a lot about that. How to develop our psychic abilities. 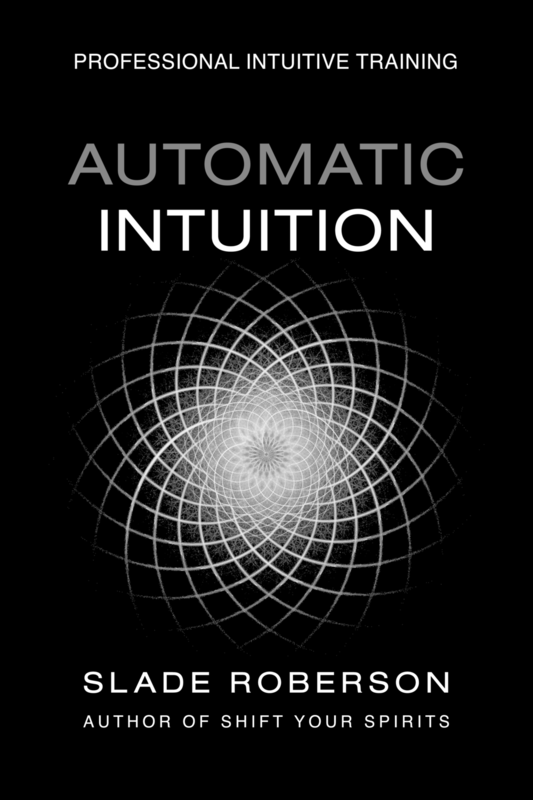 How to develop our intuition, which I see slightly different from psychic, and how to apply that in a reading. Because what happens a lot is that people, you know, when you're doing reiki or you're working with your hands, on or just above a person, and if you have those channels open, you might begin to see colours around those people. You might begin to feel the presence of spirits around you. And I think it's great. It's an incredible opportunity for the healing to be deeper, more powerful, for your client to get more out of it if you know how to do it. So we have to learn, what does it mean when you see colours around people? What do you do when a spirit comes in? 'I think your mother's here...' How do we handle that? How do we get more of it? How do we have good boundaries and ethics around it? I talk actually a lot about ethics in my book. Because I feel like people... It's really important because not everyone gets good training, not every psychic gets good training, not every healer gets good training around, what are the boundaries? How do we keep ourselves and our client safe, especially with psychic stuff. I'm curious. Do you have any kind of plans to do maybe a Facebook group or some other kind of support around the book and the people who are working with it in the process? I have a Facebook group. It's called Psychic Reiki. I would love to have you in it. Come on in, everybody! It's a real nice community and it is a... You do have to ask permission to join the group, but I'd love to have you there. And that's exactly... I pop in there every week and do some Facebook live, I do some teaching, I answer questions. It's a great community. Is there anything that we haven't touched on about the book that you really want to emphasize or get out there? I just wanted to say, I don't know, how, kind of amazed I am that I did it. It was really quite a process and it's been a very growthful personal process for me, to commit to doing it. It was a lot of work. Well we definitely do have some writers in the audience and I wanted to ask you... Like, I always feel a little bit guilty if I start to nerd out on the author stuff when I'm talking to someone else. But you and I were talking a lot about the process and this journey, and books are big project undertakings. They're, like you said, you spent three years working on this. So what did you discover about this creative process? Will you do it again? The books are like queuing up in my head, so I already have the next three books, I think, in my head. I think of them like airplanes waiting for an open runway to land. And they do build up and I do feel compelled to write. Actually, I quite like the process of writing. I really enjoy it and somehow I was under this crazy idea that that was sort of it. That you hand in the manuscript and then you're done. Suddenly a book magically happens. So I wasn't prepared for the amount of work that it took to write the proposal, which I thought was more difficult than writing the book. And I had a coach. I never would've done it... I've had some really good coaching. And that's what helped me really get over these parts that I didn't know. We're so neurotic about this, aren't we? Ohmygod, it was terrible! It had me at my edge, like the edge of my comfort zone. Once the writing was over, I was sort of fine during that period. Then I got an agent, that happened actually easily for me and a week later I had a publishing deal from a very good publisher, New Harbinger Press. They specialize in self-help and spirituality books. And it was absolutely grueling. And the editor that I had was very good but not a big hand-holder. So after, little shreds of my ego were left after that book, I mean, there was nothing. It was like burned down to a bare-bones of myself. So what happened to the manuscript, you wouldn't even recognize the manuscript I turned in compared to what it is. But I learned a ton. And I learned micro-editing, like you take out the little words that don't mean anything. And I'm super glad I did because it's so much more polished. So much more readable. The whole process of that. My editor is a grammar nazi. I mean, she has a masters degree in grammar. I'm an English major. I have an English degree. I write all the time. I don't think that I'm that bad at it. But I learned that I had so many horrible... My face turns red thinking about the things that I would fill a manuscript with unconsciously. And so, the things that she's taught me about grammar, like, 'Oh, you have a tendency to do this thing, which is really annoying, and then you're gonna have to go through and change it'. What happens is, you take that on and it becomes a part of your programming. And then the next time you write, you don't do those things. So it is the most humiliating thing in the world to work really hard on something and feel like such a smartypants and then have somebody hand it back to you marked to pieces. I mean, it just shreds your soul. It was so painful, but I'm such a better writer now. And every time you do it, it's like you're learning something, even about the structure of a book. Like when you go in and write that next outline, having been through that process, it changes the way that you start. It reduces the amount of work on the back end, sometimes, just by knowing, okay, I know what's going to happen here so let's build this in from the beginning. I just want to say that for... Yeah, go ahead. I was just gonna say, who knew that a chapter really needs an introductory paragraph and a concluding paragraph. They teach you that in high school and I never did it. And now I have it. Did you not do... Did you not identify as a writer when you were younger like that? I did! I totally did. I was like you. I was a literature major. I studied comparative literature. I was a freelance writer for Ziff Davis for ten years. I wrote magazine articles for national magazines. I always thought I was a good writer. And I think I was a good writer, but I think I'm a much better writer now. Mmm... I think you're the real deal. Because most people would crumble in the face of that and just run away. The fact that you've been through that process and your first thought is, Ooo what am I going to do next, is the sure sign of an author. I'm really excited for you to be experiencing this first big launch. I was gonna say, for everybody who's out there working on a book, there is a great power in completing projects and taking them all the way through the process. Because, like I said, you learn something from the tail end of it, which is so much bigger than you thought. That then informs what you do from the beginning and the next one. And I feel like that probably happens on some level every single time. So don't just write A book. Write lots of books. Write all of them, if you have time. Lisa, I'm so happy that our work gives us the opportunity to get together and talk like we do. Again, the book is called The Art of Psychic Reiki: developing your intuitive and empathic abilities for energy healing, by Lisa Campion. Tell us where we can go to find out more about you and this book. I'd love to see you on that Facebook group. Find me on Facebook or like me on Facebook and find my Facebook page, Psychic Reiki. I'd love to see you there. That was great, Lisa. Thank you for coming on the show. Thank you, Slade. It was so much fun.